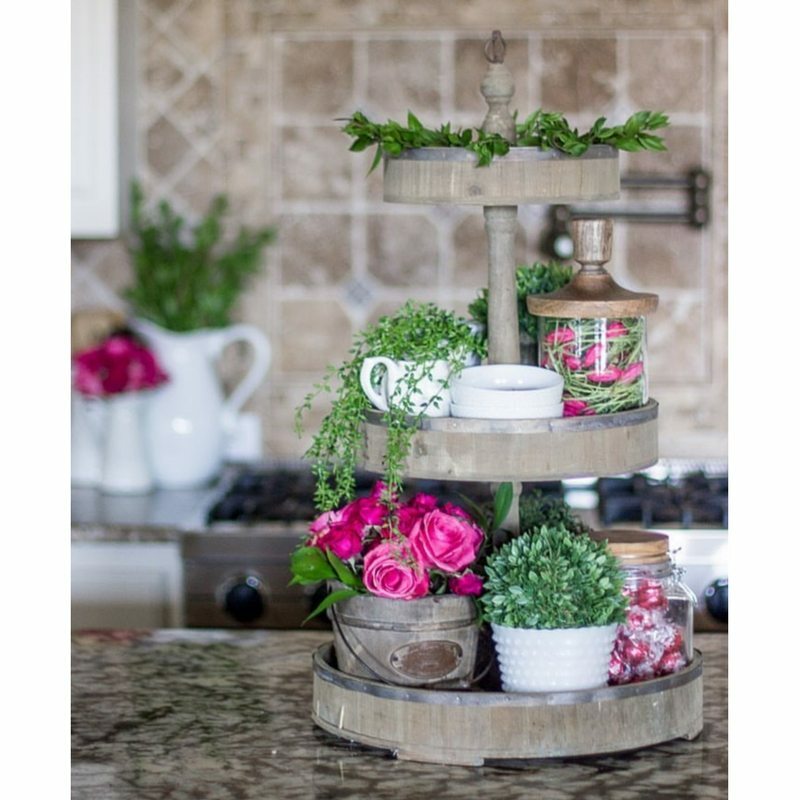 Valentine tiered trays are a simple way to decorate for this holiday. 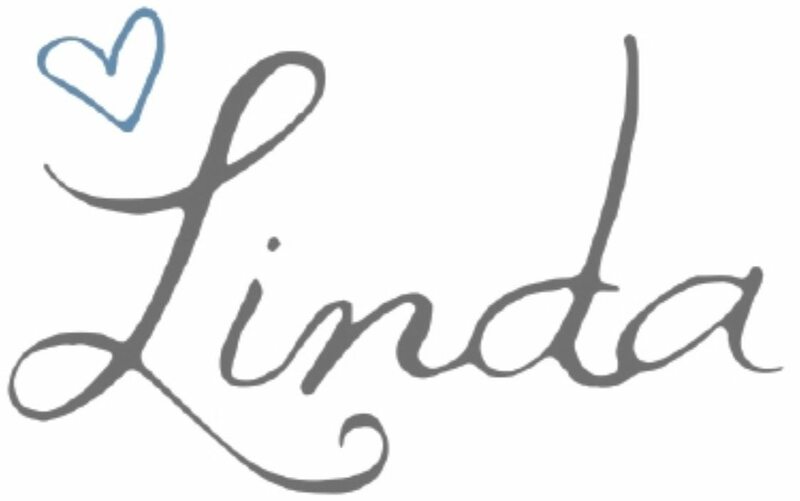 What a beautiful way to tell others they are loved. 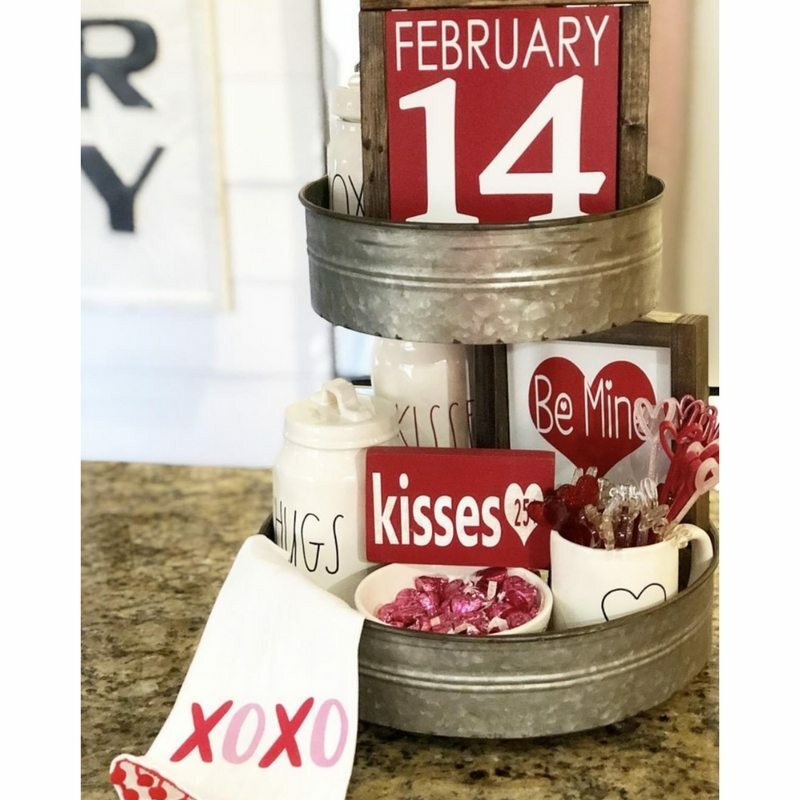 No doubt you would feel loved if you saw the Valentine tiered trays we have gathered for you. 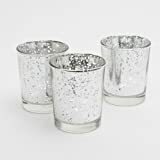 Gathering together Valentine tiered trays was an easy choice when we saw how much you loved the Christmas tiered trays. 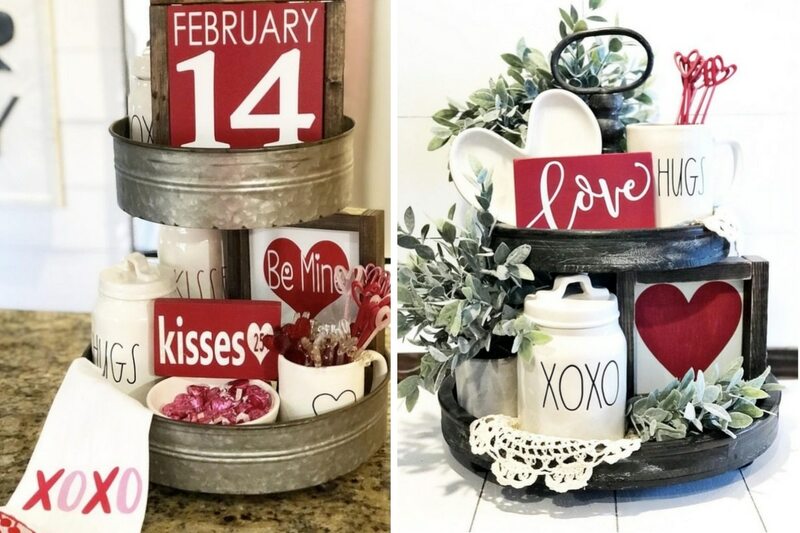 We asked some of our previously featured Instagram friends if they would share what they had come up with for Valentine’s Day and made some new friends to feature as well! 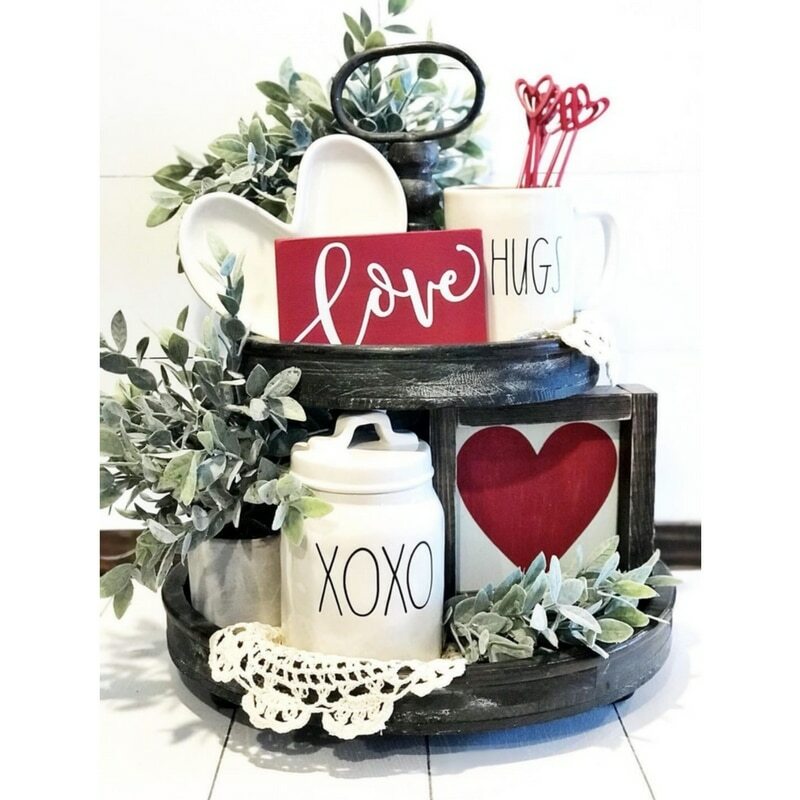 Hugs, Kisses & Valentine Wishes are what these trays scream! They display so many surprises. Kelly starts us off with some great Rae Dunn pieces displayed on her tiered tray. The black and white with pops of red keep this look so classy. The heart shaped swizzle sticks are precious on this piece. Adding greenery, such as these boxwood balls, brings life to this lovely tiered tray. It is themed out with hearts and red and green are complementary colors for sure. This distressed wooden tray is sure to add vintage style to your home if you are looking for the right stand for you. 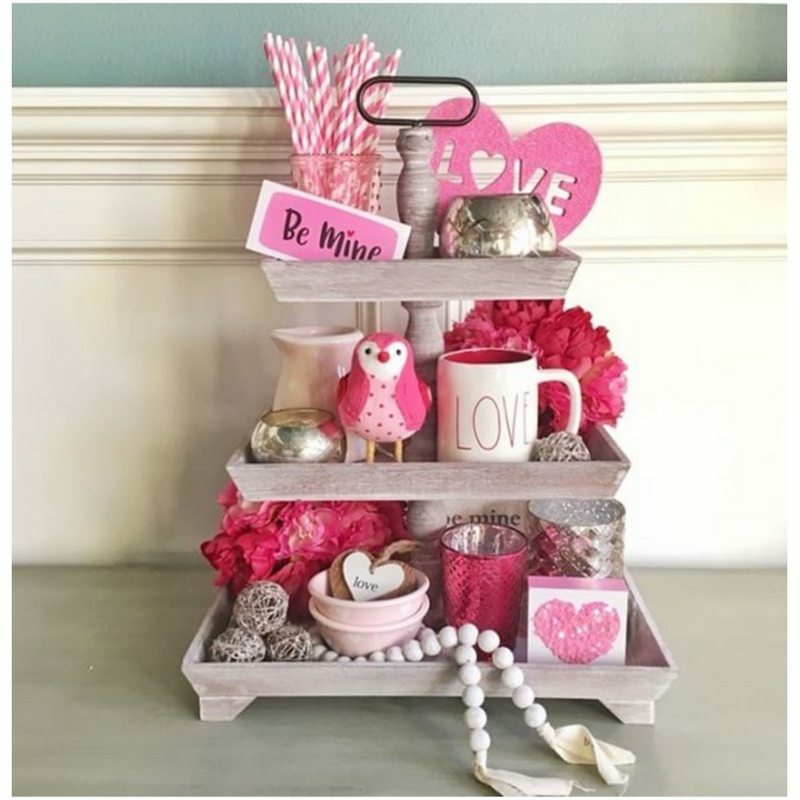 This Valentine tiered tray makes us want to open a box of Conversation Hearts. Just like the yummy candy, this tray is popping with colors and a sweet message of love. 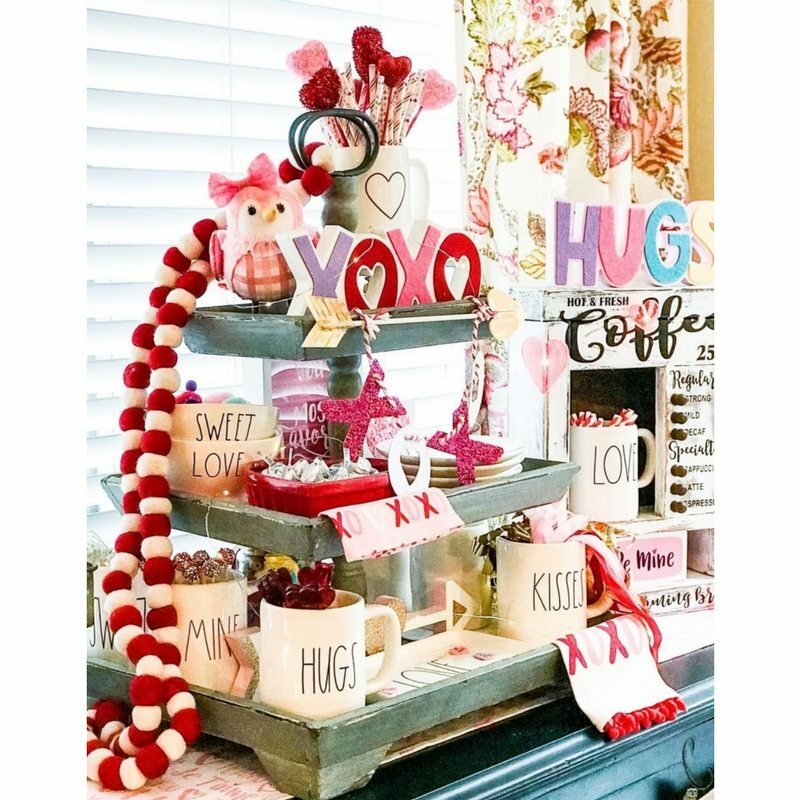 Hugs and kisses are felt by all that lay eyes on Molly’s decor! Since Valentine’s Day falls in winter, it makes sense to keep that feeling in your Valentine tiered tray. Keeping pinecones and greenery from Christmas and adding touches of hearts makes transitioning from one holiday to the next a breeze. And who doesn’t have the game of Scrabble tucked away in their closet. The use of the rack and letters to spell out a sweet message is genius. 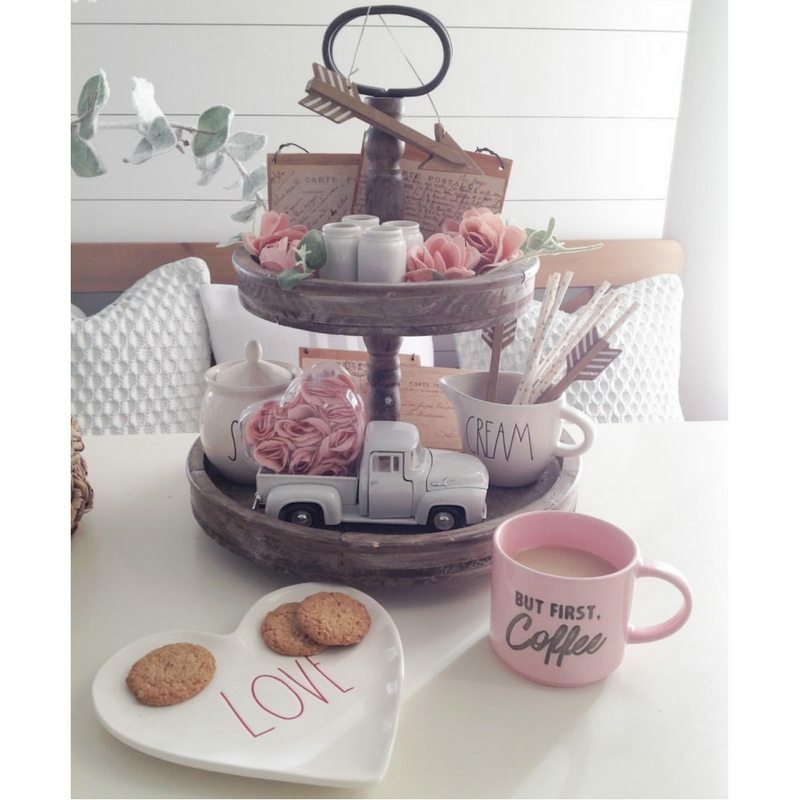 The soft colors of this Valentine tiered tray are so lovely. And can we all just stop and admire this adorable model farm truck on this tray for a minute. 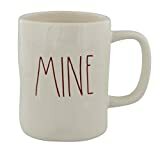 Not to mention, who wouldn’t want to stir their coffee with one of cupids arrows? No sweeter a gift then roses for Valentine’s day. Doesn’t that make you melt? 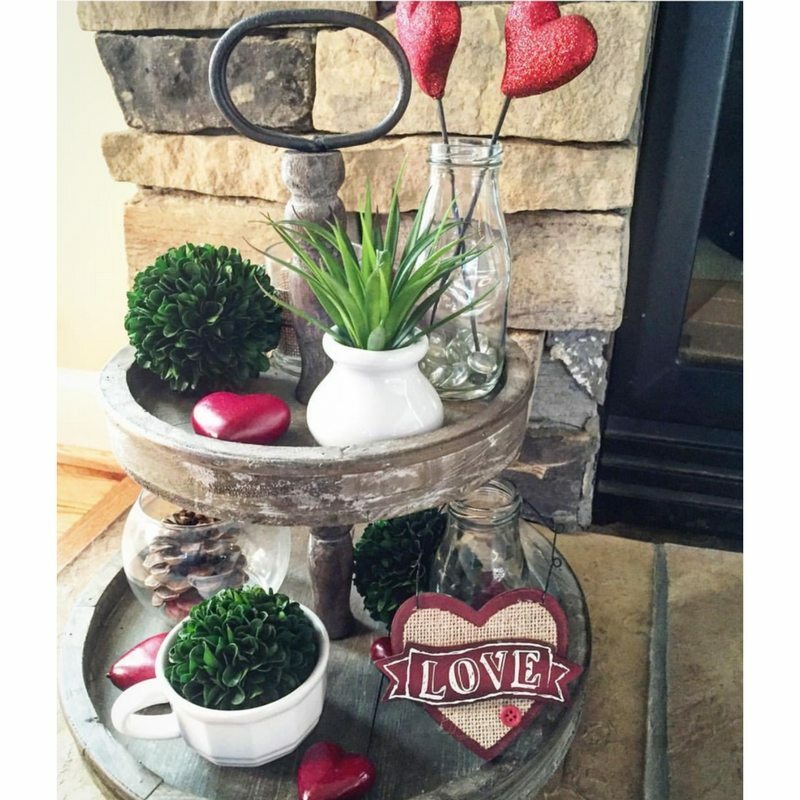 Bringing pieces of your garden in, is a great way to decorate a tiered tray for Valentine’s Day. These rustic farmhouse Valentine frames are irresistible. Chocolate kisses next to an adorable kisses for twenty five cents is perfect! And a hugs and kisses tea towel draped over the side of this tiered tray is a great way to finish it off! Pastels are beautiful on tiered trays, especially this distressed piece. So many adorable Rae Dunn pieces and pink bottle brush trees are great additions. And how can we not point out those adorable conversation heart swizzle sticks. We love how Roz uses different textures like wicker orbs, wooden beads, mercury glasses and sting art! 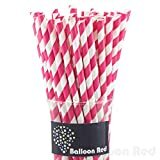 Pink and white paper straws add such excitement to any tray. 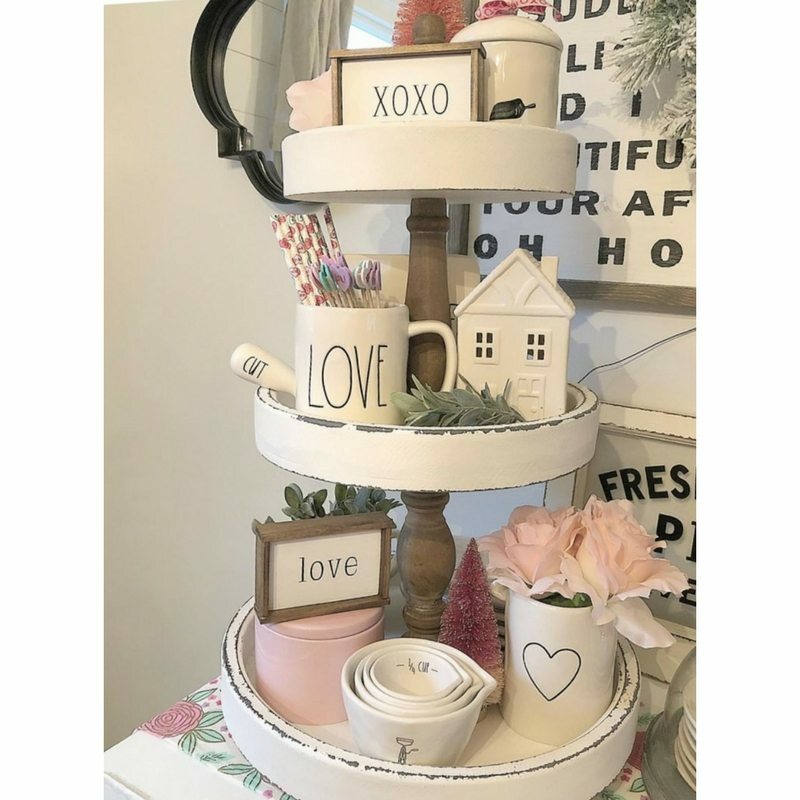 What better place to feature a little love bird than on a Valentine tiered tray? 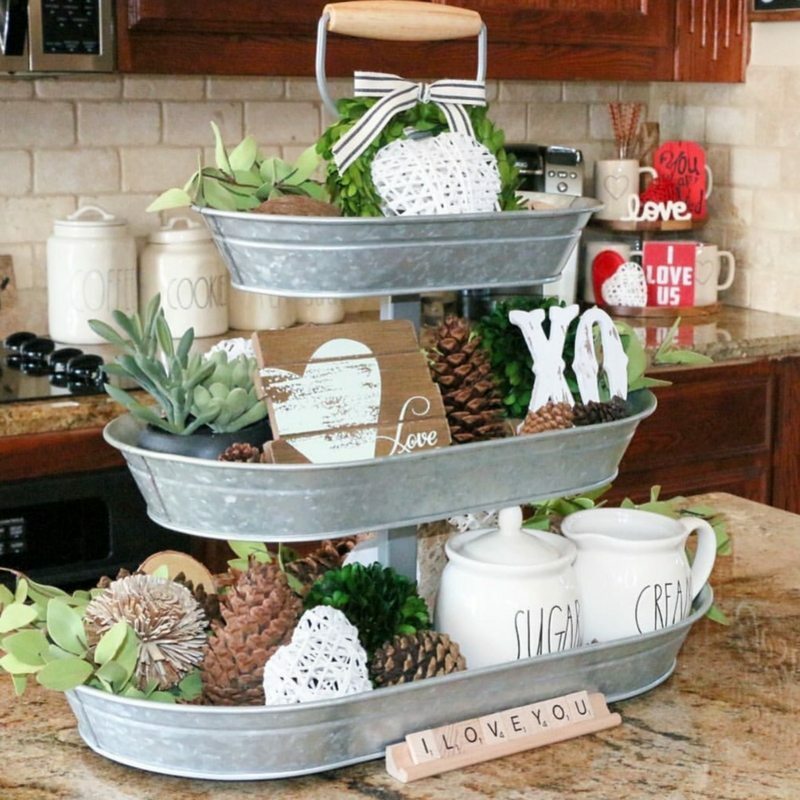 Have you added a tiered tray to your home decor since our Christmas tiered tray post? 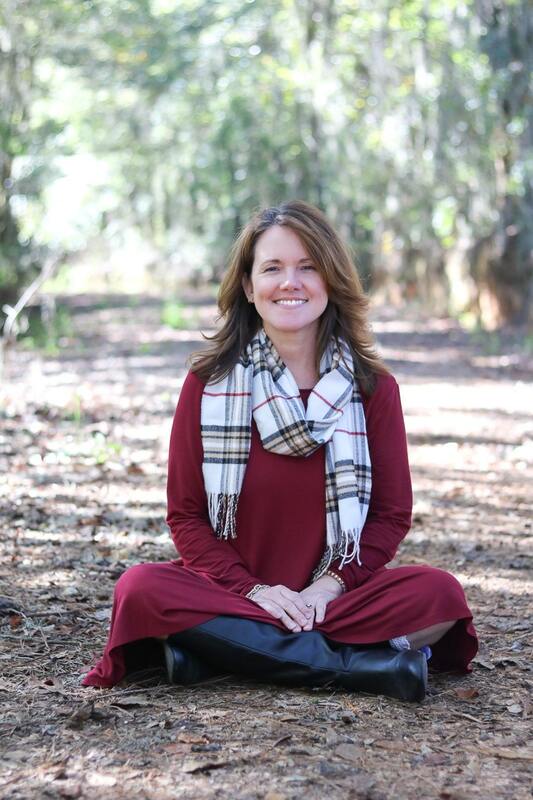 We’d love to see how you style it.